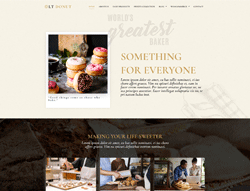 LT Donut is Responsive Joomla template that targets for Bread Store or donuts Joomla template websites. This template promotes fantastic images with photos of colorful donuts to offer your bakery a unique way and draw customers attention to your confectionery. In addition, you can introduce your most popular products, promotions and delivery options. Give your customers a chance to browse and order their favorite products online. Donut Joomla template builds on powerful shortcodes, unlimited position and easy to drag-drop layout content. Responsive layout smoothly adapts to all mobile devices. Besides, it also comes with 4 color styles helping to create wonderful websites.